Right now, there is a region-wide discussion occurring about decongestion charging, a form of mobility pricing in Metro Vancouver. This discussion is being guided by the Mobility Pricing Independent Commission which was assembled by the Mayors' Council on Regional Transportation. 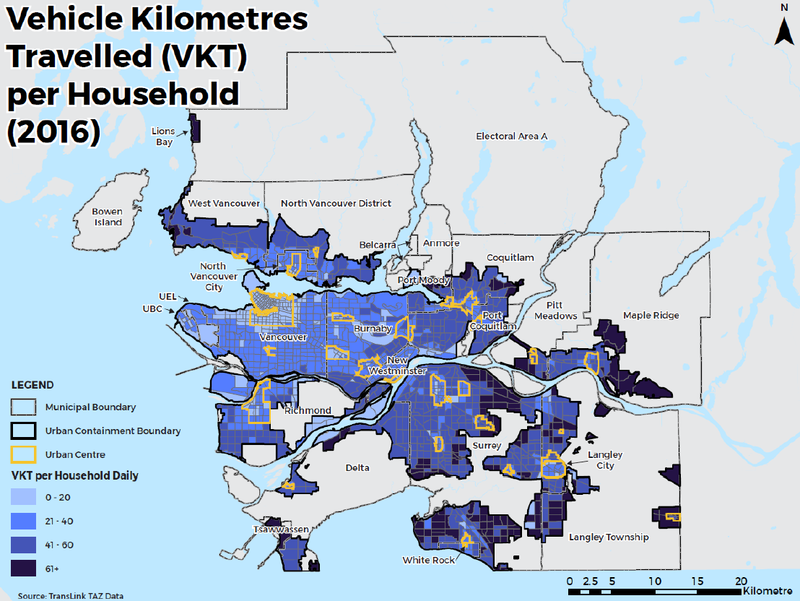 One of the documents that the commission released is called “Moving around Metro Vancouver: Exploring New Approaches to Reducing Congestion.” While I was reading the report, I saw a map labelled “Average Daily Vehicle Kilometres Travelled per Household by TAZ: 2016.” This map looks at how much people generally travel by motor vehicle during an average day. Vehicle Kilometres Travelled per Household (2016). Select map to enlarge. North of the Nicomekl River in Langley City is Downtown Langley. Pretty much everyone in this part of our town lives in apartments and townhouses. Langley City has been working to ensure that the transportation network, and the built-form of businesses and residences, support walking and cycling. Not that I am surprised, but the following map confirms that people driving less in this area. Vehicle Kilometres Travelled per Household (2016). Focusing on Langley City. Lighter colour means less kilometres. Select map to enlarge. In fact, our community is very similar to New Westminster which is a walkable community with five SkyTrain stations. 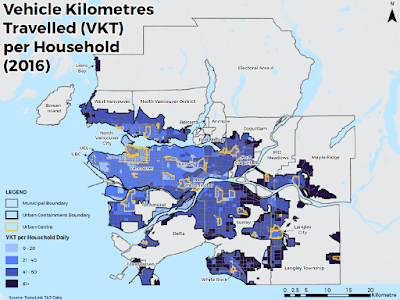 Even in the single-family housing area south of the Nicomekl River in Langley City, people drive less than the people who live in the community that surrounds the City on three sides. How we design our communities has a direct impact on how people choose to get around in them. Langley City is a perfect example of how designing a community around people will result in less driving and less traffic.